No, not the actor. John Larroquette is one of my favorites. His ever-likable persona makes him consistently watchable, and his ability to say the most surreal things as if they were, “Oh, here’s the bus now” makes him consistently funny. After he became one of the highlights of Night Court and it had had its very good run, he was deservedly rewarded with The John Larroquette Show. The name should have been a warning, that the network named it something so utterly bland. They were already terrified of what they had allowed to happen. The John Larroquette Show was, for one season, a brilliant black comedy. People called Night Court “black comedy” but I have to say, it was at most a medium grey. 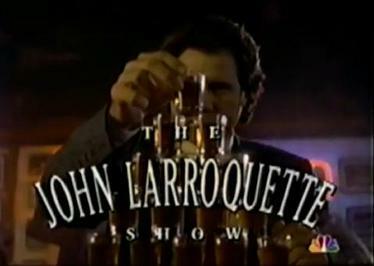 The John Larroquette Show was positively inky. One of the most memorable bits in Season 1 (where everything worth remembering about this show occurred), was when Larroquette, as bus-station manager John Hemingway, got an assistant played by Bobcat Goldthwait. Known to us only as “Boss’s Nephew,” this was an office worker in full Bobcat mode: twitchy, manic and paranoid, with no attention span whatsoever. Hemingway, a man starting out on the long march of his own struggle to stay sober, thinks he recognizes another sufferer who may be close to rock-bottom. He recommends that whatever intoxicants are making him this way aren’t really helping, and maybe they should attend a meeting together. Boss’s Nephew pulls out his one-year chip — still a distant goal to Hemingway. And to round out this story line, the next time we see Boss’s Nephew he is affable, calm, well-spoken, and much better able to contribute to the smooth running of the office. He has also, of course, fallen off the wagon. So why isn’t this show right up there with All In The Family, M*A*S*H, or even Night Court as one of our landmark sitcoms that got up to some serious business? Season Two showed us how scared the network suits had been by this show. Here’s a publicity still of John Hemingway and his new girlfriend Catherine Merrick, played by Alison La Placa. This was shot in the formerly-black bus station, now seen sporting a warm golden tone. Hemingway had been living in his office, but now he got moved to a Very Nice Little Apartment. It could have given you snow-blindness. The show lost its spark, its importance and a lot of its viewers (including me) by the third episode after this Philistine change. And it’s not La Placa’s fault. I bring all this up because I was worried when a show I liked in its rookie year, Mom, opened its sophomore season with a serious upgrade to the living quarters. Uh-oh. Here was a show – also with a strong sobriety theme – that was maybe about to suffer the same fate that befell Larroquette twenty years ago? But so far, at the halfway mark of Season 2, it seems to have maintained its edge. The original three networks now face a much wider array of competition in producing shows that are enjoyable because they are challenging, not in spite of that. It seems to be getting them to up their game a bit, and that’s only good for us all. If The John Larroquette Show had started its experiment in 2013 instead of 1993, who can say what might have been? At the very least, I don’t think it would have been smothered in its crib.